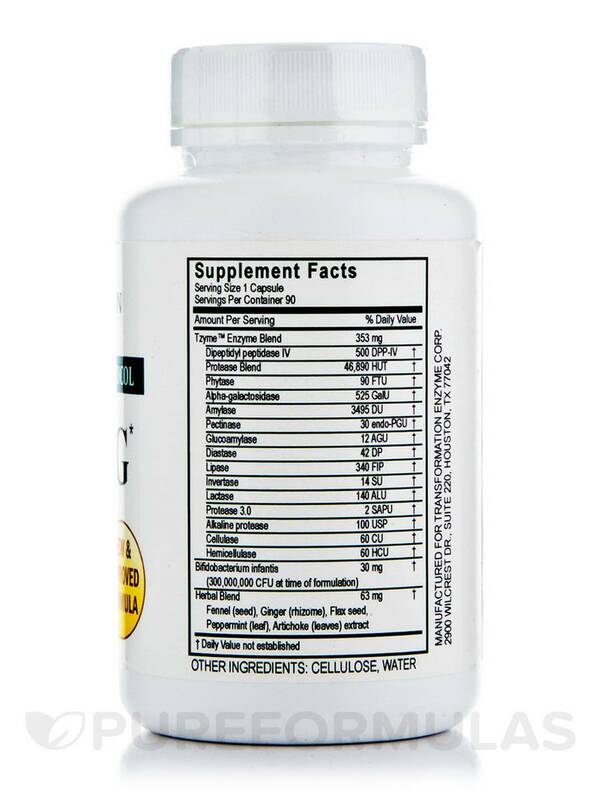 Transformation Carbo-g Assists the digestion of complex carbohydrates and gluten! Avoidance of wheat products may not be enough to maintain a gluten-free diet. For example‚ did you know that gluten is used as a food additive and may be present as a stabilizing agent in salad dressings‚ ice cream‚ and even ketchup? Our unique Carbo-G™ formula was created to complement those seeking a gluten-free lifestyle by encouraging more complete digestion and absorption of grains. diastase enzymes included in Carbo-G™. 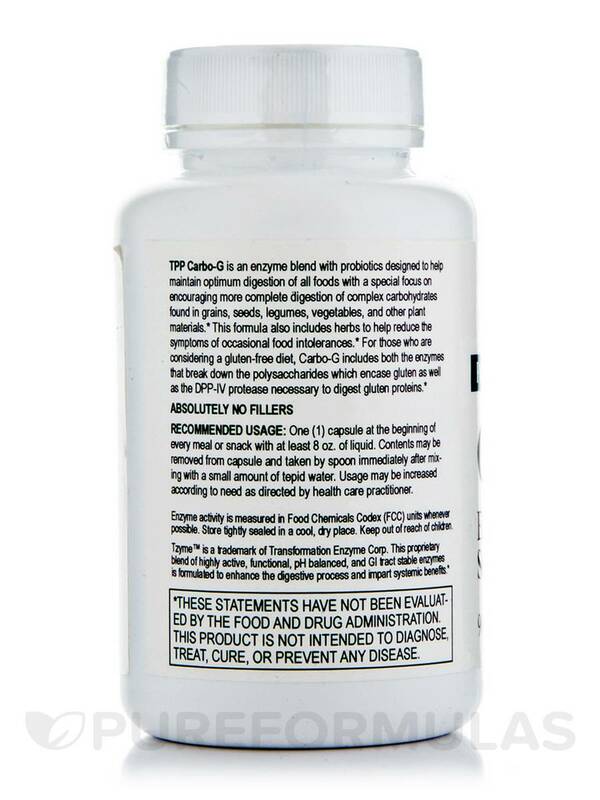 3) Proteolytic Enzymes: In addition to our traditional protease blend‚ this formulation includes DPP-IV which helps break down some of the stubborn peptides found in grain that are often implicated in gluten intolerance. 4) Probiotics: These “good” bacteria naturally present in the gut help support digestion to assist in maintaining optimum intestinal balance. 5) Herbal and prebiotic plant fiber: Includes several herbs known for their ability to promote gastrointestinal health. I used to have so much bloating and discomfort when I ate but after taking Carbo-G the bloating has decreased and the pain has subsided. Also bowel movements have improved. It helped with my abdominal discomfort and bloating. A friend who also has celiac disease told me about Carbo-G so I tried it. I am very sensitive to gluten from wheat barley & rye. If I take Carbo-G when I begin eating a restaurant meal I am MUCH less likely to experience any bad effects from consuming minute amounts of hidden gluten such as occur if a contaminated pan or spatula was used. Carbo-G gives me more freedom of choice and confidence when eating out! Convenient. No need to refrigerate. and when i called in to discuss it I was told that there were none with better dates. Will need to find a new supplier. 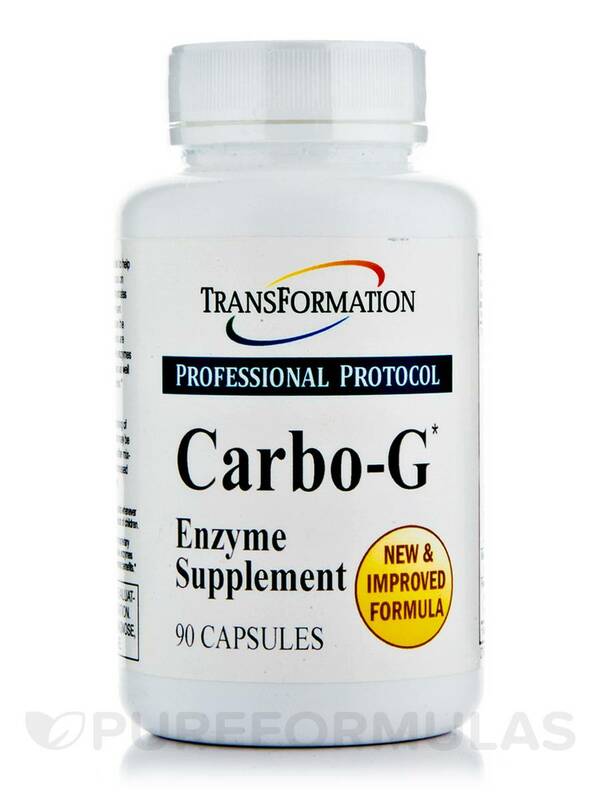 Carbo-G by Transformation Ezyme Corporation was introduced to me by my nutritionist. I frequently experience mad carb cravings and when answered experience huge carb crashes and horrible uncomfortable bloating. I feel better now and am finding my carb cravings in general have been decreased. I take one Carbo-G with every meal regardless of carb content. Ill keep coming back for more! Carbo-G by Transformation Enzyme Corporation was recommended by our doctor to help our 3 year old with a recurring rash due to food sensitivities ( wheat, milk, strawberries) and allergies. We have been using it for a month now so far it has cleared up the rash and has helped with her allergies. We will be ordering more! It has a strong fennel taste. I have to hide it in her chocolate almond milk to get her to take it (a small price to pay for the benefits). It has a strong fennel taste.